Google cloud print connector feature in Google Chrome promises to make printing more easy and quick. Ideally, you need software that connects Cloud Print with your printers. Latest Google Chrome 9 for Window has Cloud print connector feature. 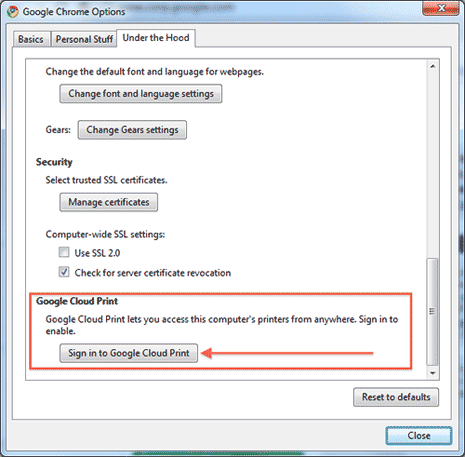 You need to enable Google Cloud Print connector in Google Chrome browser to connect printer available on your PC to Google Cloud Print. 1. Launch Google Chrome browser and goto Tools > Options. 2. On the Settings dialog box, click ‘Under the Hood’ tab. 3. Scroll down to the bottom and look for Google Cloud Print section. Then click ‘Sign in to Google Cloud Print’. 4. In next dialog box, sign in to your Google Account to enable Google Cloud Print. You should see confirmation screen after successful login. 5. Goto ‘Under the Hood’ tab in Settings screen again. 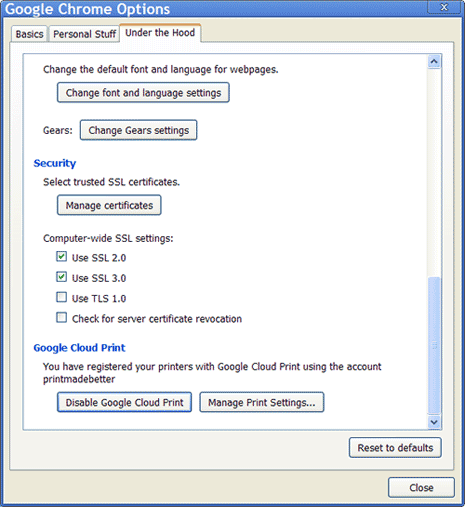 Now you should see buttons to ‘disable Google Cloud Print’ and ‘Manage Print Settings’.